Fall still hasn’t quite fallen here in Central Texas, but it’s coming, I just know it! And when it gets a little chilly, I love my handmade robe – I have one, the hubs has one, but the kids don’t. So I set out to remedy that. 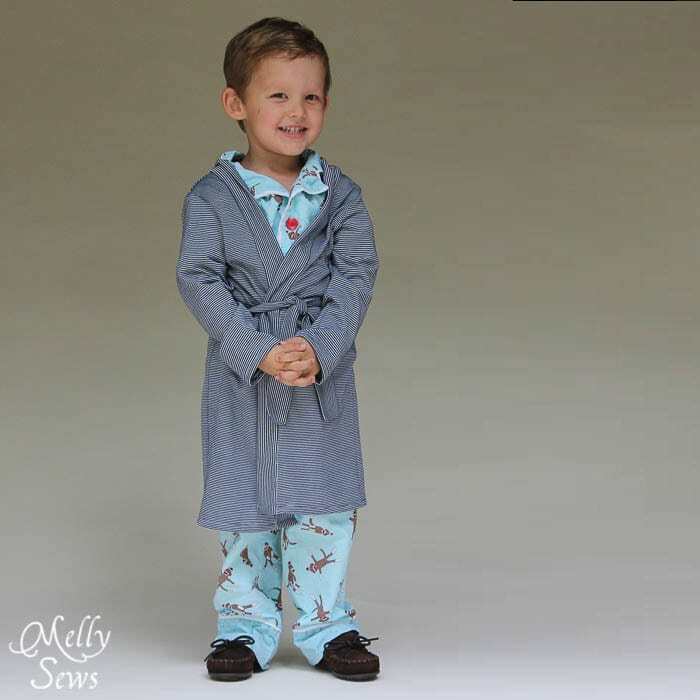 And since I want to say thank you for your support last week – how about a free robe pattern? I thought about sitting on this one until Christmas, but I’m going to need it for Halloween costumes (more on that next week) so I decided to go ahead and release it. Can be made in pretty much any fabric - knits, woven, fleece, whatever floats your boat! You'll need 1 1/2 yards for the smaller two sizes, and 2 yards for the larger two sizes. 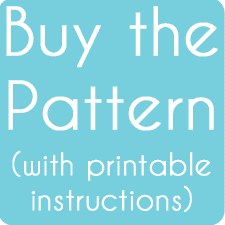 To get the free pattern (only as a newsletter subscriber), click your preferred option below, or you can buy the digital pattern + printable instructions for $2. Ready to start sewing? First, print the pattern - use Adobe Reader, print at 100% and check the test square on the first page. You'll cut at the outside edges of the gray boxes and look for the circles to match up pieces and tape the pattern together. 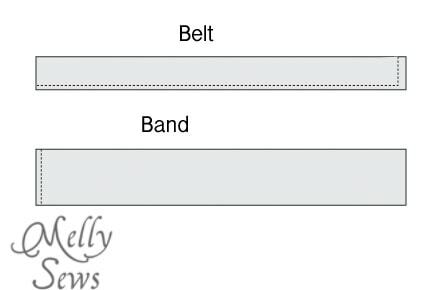 Follow the cutting instructions on the pattern; note that you need to cut rectangles for the belt and the band; measurements for each size are listed on the pattern. Sew the robe fronts to the robe back at the shoulders, right sides together. Finish these seams. 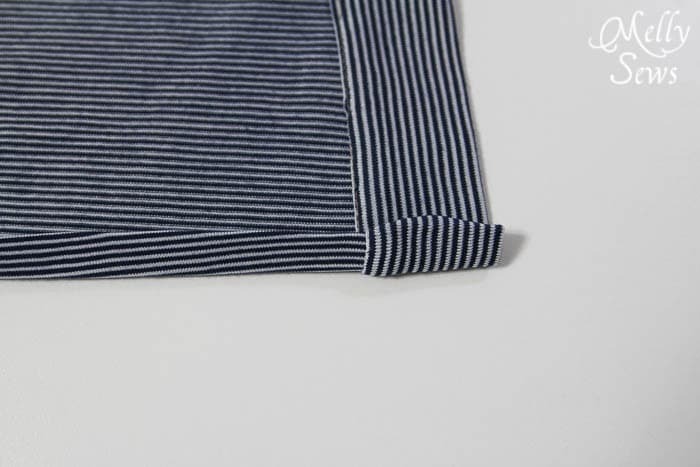 New to seam finishing? Check out this post. Make the belt loops - fold the loop right sides together, matching the long edges. Stitch. (Note: I used my serger because it was fast and it's the machine I was sitting at. You absolutely don't need a serger to sew this). Turn the loops right side out. I like to use my Dritz Quick Turn (affiliate link) tool to do this - seriously now that I have one I curse the years I spent using a safety pin. But safety pins totally work. They just take longer. Place your belt pieces right sides together, matching the short edges. Stitch across one short edge so your belt is now one long piece. Next, take your belt and fold in half, right sides together, matching long edges. 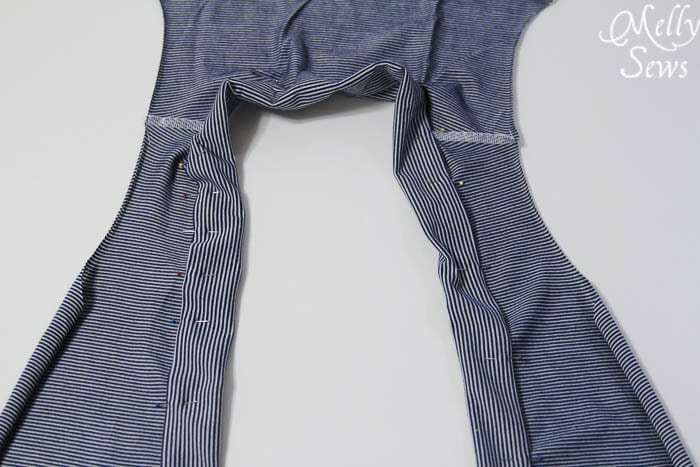 Sew down long side and one short end (top picture). 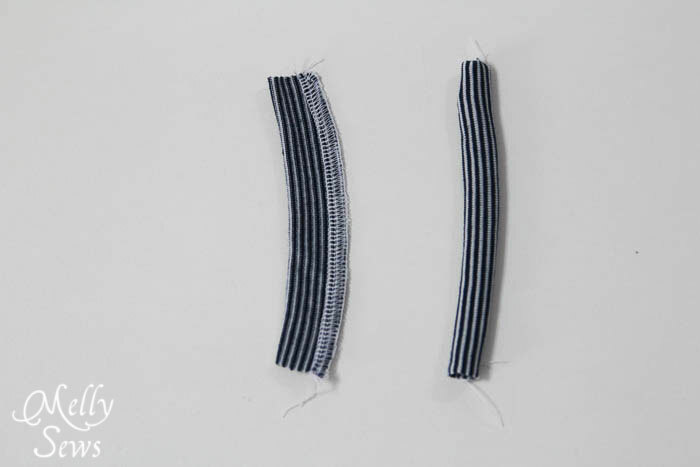 While you're at it, sew two short ends of the band together, right sides together (bottom picture). Turn the belt right side out. Fold the raw short ends 1/2" (12mm) to the inside of the belt. Press the entire belt. Topstitch across the end to close it. You can continue topstitching around the rest of the belt if desired. 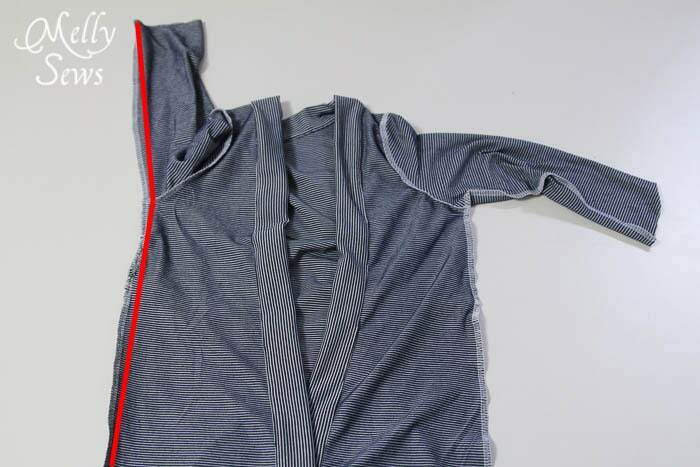 Pin the band to the robe, right sides together, starting by centering the band seam at the center back neck, then pinning down the front edges. Stitch. Again, you do not have to use a serger to do this. Press the raw long edge of the band 1/2" to the wrong side, and press the seam towards the band. Fold the band so that the folded and pressed raw edge covers the seam. Pin in place, then stitch on the right side in the ditch made by the seam. Pin sleeves to robe, right sides together, easing around the curve and sew. Pin the belt loops to the robe front. You can measure where to place these on your child, or just place about 1/3 of the way down from the armpit to the hem. Fold the robe, matching the underarm seams and pinning the robe front to the robe back at the sides. Stitch all in one seam from the robe hem to the sleeve cuff. If your band was too long, trim off any excess, then fold the hem up 1/2" (12mm) twice and stitch. 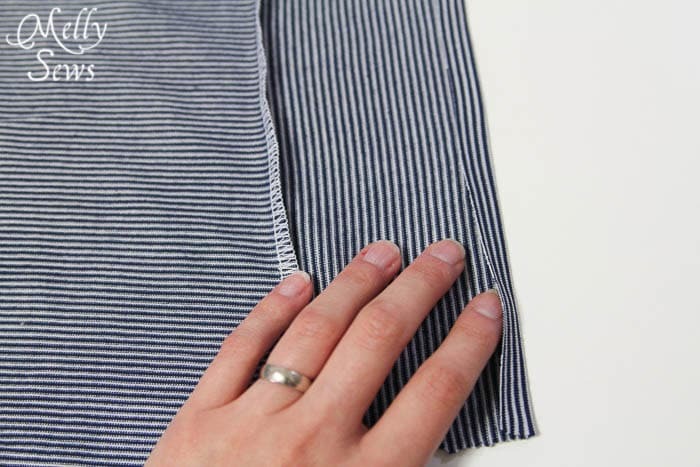 Do the same to hem the sleeves. And put that robe over your favorite pajamas. In Bean's case those would be his Lazy Day Pajamas. There is a link for making the pattern larger. It’s located in the paragraph under the 3rd photo at the top. Looks like I’ve found my next little project. And you’re little fella is just adorable in those shots! 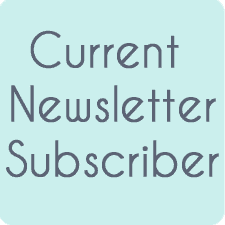 The free pattern links are in the weekly subscriber email list – please check that you are subscribed to the weekly email list. If you receive daily emails from my site, those are automatically configured through Feedburner to pull the first few sentences from any blog post. I can’t edit those emails or add links or anything like I can with the weekly emails. That sign up will generate a confirmation email, and once you confirm, then it will automatically send a welcome email with the pattern link. If you can’t find the welcome email, check your spam and trash folders. Thank you! I have two little grandsons that are just the size for these! They have moved from an apt that stayed hot (as in open the window in the winter hot!) to a house that the thermostat will be turned down in! 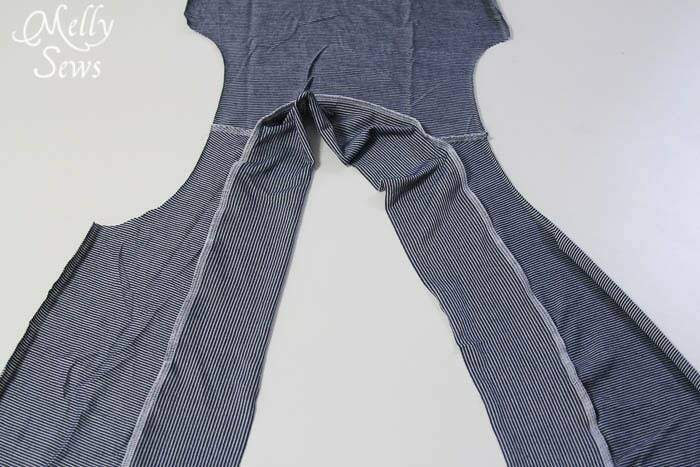 I have made them patterns for sleep pants from old pants but a robe would really be appreciated I know! Hi, I’m a subscriber too but I also didn’t get any link for a download. So I just signed up to your email list, will I receive this even though it’s already been sent out? I really need it! 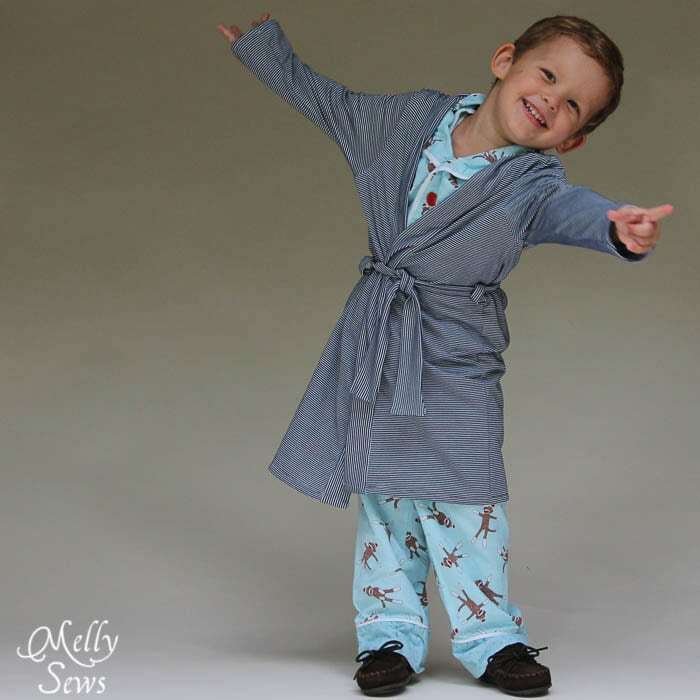 Thank you for the free robe pattern and tutorial:))))) Such a sweet gift to blogland!!! You have made my life so much easier, thank you!! Thank you! Can’t wait to make one for my little guy. Would you be able to give approximate fabric requirements for the different sizes? I didn’t measure them out since I was sewing from an old sheet. I might have time to measure those out later, but not this week. I just cut this out in the 3T/4T size. I got two yards of flannel from Joann just to make sure I have enough, and I think you could squeeze it onto 1 3/4 yards. But mine’s a solid, if you use prints or stripes you might need more. That’s my best estimate! Hope it’s helpful! I’m a subscriber too, but I didnt get the link, I also check in spam… Do I have to re-subscribe? Like several others, I’ve been a subscriber for a long time. I got this announcement email, but no link for the pattern. I did check my spam filter, I check it every morning and every afternoon. No pattern link. I’ve checked everywhere I can think of on this site as well, and no links to the pattern. Any ideas? I also am a subscriber but got no pattern . Love to make for the grandsons for Christmas. What are the fabric requirements for each size? Thank you for the chance to obtain this pattern for free. You have a good heart! I didn’t measure them out since I was sewing from an old sheet. Howdy from a fellow Central Texan! I just found your blog and am super excited to make two of these to go with my kids’ Christmas pjs! Thank you so much for sharing this tutorial!!!! Thanks for sharing your sewing genius! I made fleece robes for my monkeys last winter but I will use this to make lighter-weight ones out of flannel or knit for spring and summer. Thanks again! Melissa, this is SO cute! My girls would love to have some of these when it gets cooler (IF it gets cooler, ha!). Thanks so much! I tried to subscribe to the weekly newsletter but the link is broken. I would really like to subscribe and get this pattern. Thanks. Mailchimp is currently experiencing downtime with a data center issue. Please try again later. Wow Melissa – this is awesome! I see my question was already asked and answered about the amount of fabric. Thank you for being so quick to reply to questions for us. I’m sure it can’t be too much fabric and with the pattern pieces I’m sure we can figure it out easily. I also read other comments that seem to be thinking the same as I saying they are going to use this to make gifts for their Grandchildren. That was the very first thing that came to my mind. I’ve already added this to my list of things to make for them as a matter of fact. Thank you so much. I’m thinking already how stinkin’ cute this robe will be using minky/cuddle fabrics. I wonder if a belt made from cotton ends though with minky/cuddle for the back might stay tied better than a belt made from the minky/cuddle fabric though. Might have to play with that and see what happens since I know how slippery minky can be. Thanks for such a cute pattern! I have all the fabric cut out (the 3T/4T took about a yard) and am just getting started sewing. One question: am I supposed to sew the two belt pieces together (short sides, rst) before following directions to fold, and sew one short and one long side? Thanks so much! The little sis in the house has been dying to have her own fleece robe just like her sister! 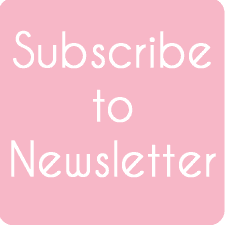 I follow on Bloglovin’ but when I subscribe to the email listing, nothing happens. I’ve checked my spam folder and other settings, to no avail. Did anyone else have this problem? 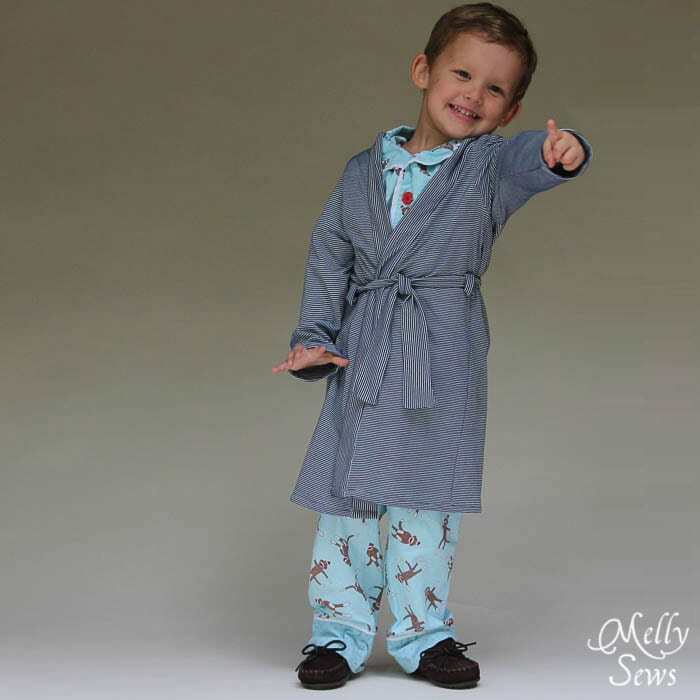 This robe is so cute – especially on your adorable son! I can’t find anywhere that says how much fabric I need to purchase. Am I just missing it somewhere? I am loving this robe! I am going to make this for my granddaughters to match the pj’s I am making. They will love it! Quick question though – the front piece says to cut 2, I’m wondering if these 2 should be mirrored? Thank you so much for this lovely pattern! Turn the belt right side out. 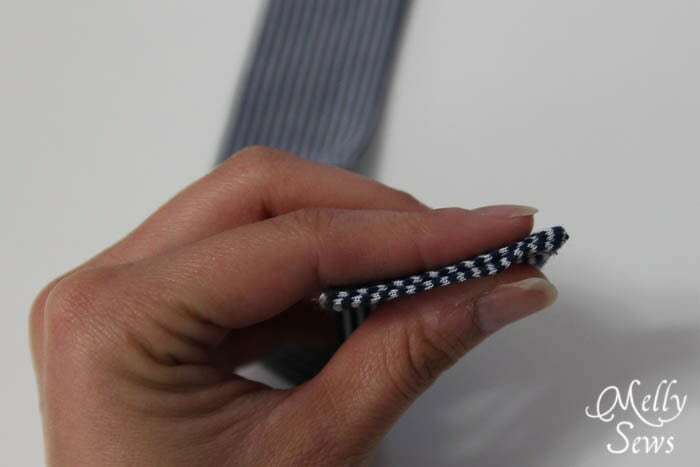 Fold the raw short ends 1/2″ (12mm) to the inside of the belt. Press the entire belt. Topstitch across the end to close it. You can continue topstitching around the rest of the belt if desired. Your forget to say to sew the two belt pieces together at the short end and then to sew around the three edges. Otherwise the belt is to short. Thank you for the pattern it looks adorable on my 1 year old grandson. All he needs is a sippy cup of milk and a newspaper and he looks like a mini of his dad. Thanks so much Melissa, I made a robe for each of my 3 kids a couple of weeks ago as the ones they had were a few years overdue to be replaced as they were far too small. They wanted me to add a hood so I just used the hangout hoody hood and added some patch pockets and I have 3 very happy kids – we couldn’t wait until Christmas as we’re going into summer here in Melbourne and I made them from a snuggly black fleece (their choice). I hope you have a lovely Christmas! 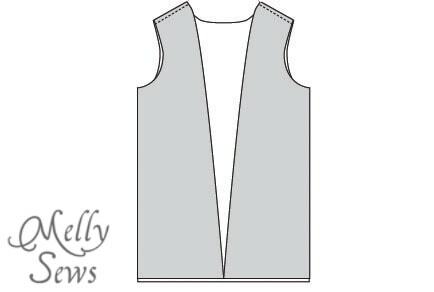 Do you have a pattern or dimensions or a description of the shape for the hood you made? I just made one of these out of a soft fleece for a 2 year old, and he Loves it! Thank you!!! 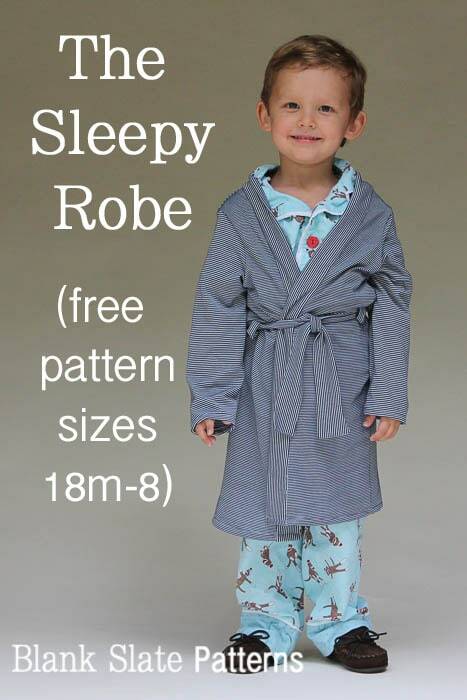 I love this free pattern, but I am wondering how I can use it to make a robe for my 15 year old son? I am posting with my findings for the amount of fabric I needed for this project. I made made sizes 3/4 and 5/6 in directional prints. For all the back, fronts, and sleeves, I needed 1.5 yards, and I had a little bit left over for each size (enough to make a matching robe for a 15″ doll in the case of the 3/4 size, and probably enough from the larger size’s scraps). I bought 1.5 yards of coordinating fabric for the belts and bands (I made three robes, 2 in size 3/4 and one in size 5/6), and I have some leftovers of that as well. Since I used a not-stretchy flannel, I would not have preferred to buy less fabric for the 3/4 and had just enough length for the 5/6. I would also recommend getting 1.5 yards for size 18 m/2, as Mars suggested (above). Also, ditto Mars’ comment about sewing the belt together. In fact, I would recommend making the belt a bit longer. It’s long enough for me to tie in a knot but not a bow. This problem may be avoided if you’re using a stretchier fabric, though. Also, beltloops placed 1/3 of the way down was way too low for my daughter’s liking. I really recommend measuring if you can. I asked Melissa about this in an e-mail, and she said 1/4 of the way from armpit to hem may be better for the larger sizes. For a tiny 3.5 yr-old (I made her size 3/4) and her tiny 5.5-yr old brother (size 5/6), I asked them where they wanted to tie the belt, and it turned out only about 4 or 5 inches below the armpit. They are super skinny/small kids, just for reference. Thanks for the free pattern, Melissa! Good luck to everyone else sewing it up. Thanks for the pattern. I made a shorter version for my son and he is now the best looking Ninja on the block. Thanks so much for sharing this! I just made one in polar fleece in size 5/6 ( took 1 metre of 150cm wide). My daughter is very happy! Now to make another for her sister…. hola, me encanta esta pagina, todo esta calidad, gracias por estos aportes tan bueno. Discovered this via a Pinterest link yesterday. I’ve subscribed to your newsletter. Is there any way i can get access to this pattern please? I always love to try somthing diffent in craftting and get new idaers. Thanks so much for this pattern. I have looked in several shops in the last couple of weeks for a robe for my grandson, but apparently only little girls in Perth Western Australia get cold on winter nights – not little boys. I had a fantastic pattern years ago, but I’ve lost it :-(. I am looking forward to stretching my ‘sewing muscles’ while making this for my grandson (he stays over once a week and has a mini wardrobe here). Thanks again, I wasn’t looking forward to paying out again for a pattern that I will probably find when I least expect it!! Hi – just cut the pattern out for the robe. My daughter in law wanted a traditional/smoking jacket type robe like my son had 30 years ago and we couldn’t find one for a 1 year old. I will make the 18month size and she can put it away. I’m going to make it in a tweed type material. Only thing is I have never made clothes before – so I hope this is pretty easy. Thanx you so much for the pattern because I just couldn’t find one in the smaller size. I just subscribed and downloaded the pattern to this amazing robe, thank you for sharing the pattern with us all. I have been dreaming of making a robe for my kids since I don’t find them in stores too often and when I do they are so pricey! I am very excited to make one for each of my beans and in different sizes. Thank you to the more experienced readers that have tried it and given suggestions, it is helpful to novices like me. What size and type of paper do I print this on? It will print on regular US Letter or A4 size paper. Thanks very much for making this pattern available for us. You are so thoughtful! I’m sure my little girl will love it! Can I print the patter instructions? I can’t find any link for this. I don’t have them formatted for printing. You can print the page from your web browser. Thank you. I just made the size 5/6 for my 5 yo son. It looks great and he loves it. Thanks for the free pattern; however, I cannot find the link. I didn’t click/print when it was first introduced and now can’t seem to locte it in the newsletters……what am I missing? I have a question on the robe. I am making the robe for the size 18 month, and followed the instructions and once I placed the band on the robe front and centered it in the neck, the band is about an 3/4 inch short from meeting the hem line on both sides. how would you suggest to make the 2 pieces match evenly or does it matter since it has to be hemmed up an inch? Thank you for sharing this pattern!!! Just spent the morning making this Robe for my 3 year Granddaughter for Christmas. I used Fleece and it was easy to sew and came out beautiful!! Thanks again. Hello! I just made 2 of these simultaneously, one for my 5 yo girl and the other for my 2yo boy! Thank you so much for the great pattern! A quick question – I used fleece for both, apart from the sleeves for the smaller size where I used a much softer, fluffy material (the kind that you would use for making strokable, very soft & cuddly teddy bears!). 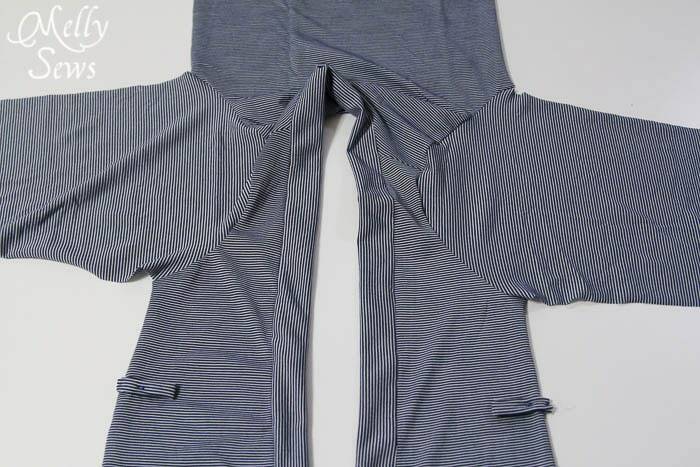 When put on a hanger, the smaller size with soft sleeves looks as though the sleeves are put on back to front, i.e., the sleeves naturally fall backwards. I thought the pattern for the sleeves had no back or front but was I mistaken? The bigger size I made looks perfect, so I’m thinking it could be due to the materials not agreeing with each other. Any thoughts or advice would be muuuuuuch appreciated, as I want to make a summer version too! Again, thank you very very much for the pattern and the tutorial!!! I made these for my twin grandson’s third birthday this weekend just gone. They LOVE them! They love snuggling in them and playing with their toys in the morning all snuggly and warm in their fleece dresing gowns. I love this pattern, I made two of these for my kids for Christmas! I just wanted to let other crafters know there is a simpler way to put on the band. I found that if you fold the band in half lengthwise and then sew entirely along one raw and turn it, then surge inner edge right sides together along the front of the robe it will allow for a completely finished edge and it is much faster. It is a beautiful robe, thanks for the tutorial. I’m making these in the 3-4 size for our granddaughter and grandson. I can get a whole robe, w/ 2 pockets (popular request) and a hood out of two bath towels. (plus if you have towels that are otherwise good, but a little frayed on the edges, you don’t have to buy anything. I used wide bias tape for the trim. Very cushy! I just finished making 4 of these robes for my daughter and 3 cousins for Christmas! They turn out super cute. I used directional flannel prints and it took me about 1.5 yards for the 18/2 and 3/4 sizes, a little less than 2 yards for the 5/6. As others said above, I would recommend making the belt longer if you don’t have a stretchy fabric. I feel like a sewing rockstar after getting these all done! Great beginner-to-intermediate project. Thanks for the free pattern and great directions! Thank you for this pattern. This comes definitly to my list to-sew. Sometimes its easier to sew than to search a cute robe. Thank you!! I can’t wait to make it! Your little model is absolutely adorable! Can’t wait to try this pattern. Thanks so much for your generosity. I was needing a pattern with the crossed material for my grand-daughters Halloween costume and shortening this robe to a shorter shirt length should work perfect. Thanks for the great pattern. When all is said and done I just might make her a robe also. Nice simple robe! This would be a great project for beginners. Thanks for sharing the free pattern! Thank you for offering this free pattern and great tutorial. I can’t wait to made robes for my sons for Christmas! I made one for my granddaughter. I added a hood, and sewed the belt into the sides of the robe. thanks for the tutorial and pattern! i made these for my two boys, ages 5 and 7. I made them out of fleece for those cold winter nights. Turned out perfectly! the only thing I did differently was attach the waistband in the back to keep it in place and make it easier to tie. The directions were great and easy to understand for an advance novice sewer. I love that you have boy patterns, they are so hard to find. Thank you! Thanks so much for a great pattern! The instructions were very clear and it turned out great! O my goodness, Melly is my new best friend. I can’t wait til Christmas to give Rescue Bot robes to my three grandsons. So quick and easy. Thank you, thank you.